Its updates time and sadly I must start on a negative note. Some of you may notice that the staff manager (Im not naming names) has been demoted. The reason for this is that a staff member in Skyblock was abusing his role and was getting away with it because he was friends with the staff manager. Obviously this is not acceptable so they have both been removed. I am 100% against staff abuse and take it very seriously. My main responsibility when hiring staff is to make sure they treat you fairly and with respect. The good news is that I have a few ideas for a new staff manager who will create a more friendly staff team and I will be releasing info and updates on this soon. Another important thing to update you on is that the mini games (Skywars, Bedwars and Eggwars) are now all changed to allow pvp hacks. The reason for this is that it is impossible to have staff checking every single arena in all the mini games so in the interest of fairness, we will allow anyone to use pvp hacks on these mini games and this will free up staff time to focus more on removing hacks from the other game modes. To be clear, all other game modes are NOT allowing hacks. For the new factions spawn (Don't worry its not resetting yet) we decided, instead of getting a professional builder that it might be more fun to have a competition. We decided to hold a competition to see who can build the best factions spawn. The winning spawn build will be used on the live server and the builder will receive $50 (you can have the money either in Paypal or as credit on the donation store). A winner will be drawn on the 1st June. I am so excited to everyones builds! If you see a build that you like then please comment on that post as peoples opinions on the post will make a difference when deciding the winner! Heres to the rest of us! As I've not done an update for a while, I thought I would check in with everyone just to say hi. Earlier today someone asked me if I remembered 'Plot Wars'. This made me think. Plot Wars was one of our 1st ever game modes, back in 2014. This means we have been a server now for almost 4 years. Those that has been around for a while will know that I sometimes make updates to say how much I love the Blockdrop community and how its our strength together that makes Blockdrop so great and keeps us going day after day. I think the fact that we have been here for 4 years is because of this. Most servers aren't long term things. Some get big quick and die fast, some fade away. But nearly all last less than a year. Mostly for various reasons, normally the owner neglects the server, or they just fail to keep up to date. But mostly its because these servers have a player base, not a community. There is a difference and we have a community, a great one. Blockdrop is still going strong because its a great place to be. People stick around here for years, not because of the game modes, but because of the community. Its because of their friends and even enemies because they are the real key thing that make up a server experience. So I just wanted to say thank you, to everyone, old and new, for being a part of this amazing community and helping us to forward into the future stronger than ever. Pulled forward by our desire for excitement and strengthened by our 4 years of strong heritage, I look forward to another 4 years of Blockdrop! For those wondering if theres any news. The main thing I'm going to be working on is the anticheat. Im working on making it faster and more accurate, you should see some big improvements over the coming weeks. When I started Blockdrop I was a player on a cracked server. I started Blockdrop because I noticed that cracked servers where a lot worse than Premium servers. I did not like this. I believe that someones wallet should not effect their access to a good game play. I wanted to make a cracked server that could be better than the expensive servers. We now have premium and custom plugins, builds and game modes that are better than most premium servers and a great community thats made us outlast most of them to. Thank you! Lately I have been thinking of ways to bring the Blockdrop community closer together. I think its great when everyone gets on and knows each other so I will be working on ways to bring everyone together. Introducing Ender Dust! These new npc's will be popping up on blockdrops gamemodes very soon. 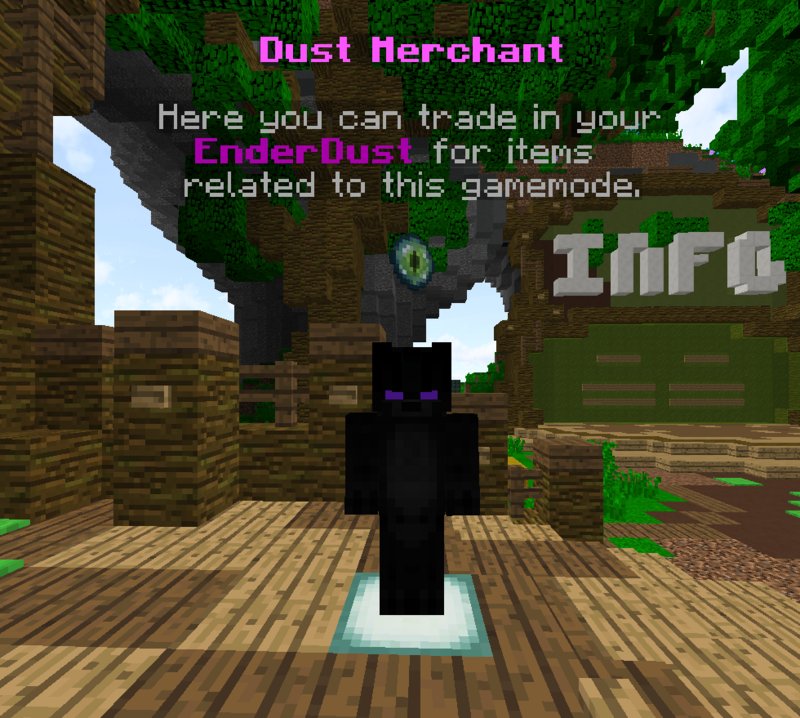 at the dust merchant you can trade in enderdust for special items related to the gamemode you are on. You can get dust from winning minigames, killing mobs and purchasing them from /buy! Your dust balance is global and you can spend whatever dust you earn on any gamemode on the whole of Blockdrop network!. Be sure to keep a look out for upcoming events where we will be giving winners enderdust.